John Fitzgerald Kennedy was the thirty-fifth president of the United States, serving from 1961 until his assassination in 1963. Although his administration had few legislative accomplishments, Kennedy energized the United States by projecting idealism, youth, and vigor. Kennedy was born May 29, 1917, in Brookline, Massachusetts. His father, Joseph P. Kennedy, was a self-made millionaire and the son of a Boston politician. His mother, Rose Fitzgerald Kennedy, was the daughter of John F. ("Honey Fitz") Fitzgerald, who served as a Representative and a mayor of Boston. Kennedy, one of nine children, graduated from Harvard University in 1940. His senior thesis, "Why England Slept," which addressed the reasons why Great Britain had been unprepared for World War II, was published in 1940 to great acclaim. His father thought that Kennedy would become a writer or teacher, and that Kennedy's older brother, Joseph P. Kennedy, Jr., would go into politics. World War II changed those plans. Kennedy joined the Navy in 1941 and commanded a PT boat in the Pacific Ocean. In 1943, the boat was attacked and destroyed, and Kennedy emerged a as hero, owing to his valiant efforts to save his crew. His older brother Joseph was killed in action in 1944. Kennedy's father then transferred his political goals to Kennedy. In 1946, Kennedy was elected to the U.S. House of Representatives from the solidly Democratic Eleventh District of Massachusetts. He was re-elected in 1948 and 1950. In 1952, he was elected to the Senate, defeating the incumbent, Republican Henry Cabot Lodge Jr. Kennedy kept a low profile at first, working on legislation that benefited Massachusetts. Back problems and other physical maladies bedeviled Kennedy during this period. He underwent two operations on his back, to alleviate chronic pain. During his convalescence, he wrote Profiles in Courage (1956), a series of essays on courageous stands taken by U.S. senators throughout U.S. history. It won the 1957 Pulitzer Prize for biography. In 1956, Kennedy sought the Democratic vice presidential nomination. He made the presidential nominating speech for adlai stevenson, of Illinois, who was nominated for a second time to run against dwight d. eisenhower. Despite a vigorous effort, Kennedy lost the vice presidential nomination to Senator Estes Kefauver, of Tennessee. In 1957, Kennedy was appointed to the Senate Foreign Relations Committee, where he became a critic of the Eisenhower administration's foreign policy and a champion for increased aid to underdeveloped countries. He also served on the committee that investigated corruption and Racketeering in labor unions and the head of the Teamsters Union, james r. hoffa. In 1960, Kennedy won the Democratic presidential nomination. He selected Senator lyndon b. johnson, of Texas, to be his running mate. After a vigorous campaign that included television debates with Republican richard m. nixon, Kennedy won the election by fewer than 120,000 popular votes. He was the youngest American ever to be elected president, as well as the first Roman Catholic to hold the office. His impressive inaugural speech contained the popular phrase "Ask not what your country can do for you—ask what you can do for your country." Once in office, Kennedy drafted a series of ambitious measures that were collectively entitled the New Frontier. These policies included expanding the space program, instituting Civil Rights legislation, aiding education, improving the tax system, and providing medical care for older citizens through the Social Security program. Most of the New Frontier programs failed to progress through a Congress that was dominated by southern Democratic leadership, but many were enacted by President Johnson following Kennedy's assassination. The Kennedy administration was enmeshed in a series of foreign crises almost immediately. In April 1961, Kennedy was severely criticized for approving an ill-fated invasion of the Bay of Pigs, in Cuba. This clandestine operation, conceived during the Eisenhower administration, was conducted by anti-Communist Cuban exiles who had been trained in the United States, and it was directed by the Central Intelligence Agency. The invasion achieved public notoriety when it failed and created international tension. In June 1961, Kennedy and Premier Nikita Khrushchev, of the Soviet Union, met in Vienna to discuss ways of improving Soviet-U.S. relations. Instead of proceeding with those discussions, Khrushchev announced an increased alliance with East Germany. Later, the Berlin Wall was constructed to prohibit Western influence and to prevent persons from fleeing East Germany. In response, the United States added to its military forces in Germany. The most serious crisis occurred in October 1962, when the U.S. learned that Soviet missiles were about to be placed in Cuba. Kennedy issued a forceful statement demanding the dismantling of the missile sites and ordered a blockade to prevent the delivery of the missiles to Cuba. The world was poised for nuclear war until Khrushchev backed down and agreed to Kennedy's demands. Kennedy's handling of the crisis led to national acclaim. U.S. involvement in Southeast Asia began to increase during the Kennedy administration. Kennedy agreed to send U.S. advisers to help the South Vietnamese government fight Communist rebels. In 1963, the United States became involved in overthrowing the corrupt and unscrupulous South Vietnamese government of President Ngo Dinh Diem. On the domestic front, Kennedy interacted with a newly invigorated Civil Rights Movement that was seeking to integrate the South. In 1961, federal marshals were sent to Montgomery, Alabama, to help restore order after race riots had erupted. In 1962, Kennedy sent 3,000 federal troops into Oxford, Mississippi, to restore order after whites rioted against the University of Mississippi's admission of james meredith, its first African-American student. In 1963, Kennedy was forced to federalize the Alabama National Guard in order to integrate the University of Alabama. Later that year, he federalized the Guard again, in order to integrate the public schools in three Alabama cities. Faced with these problems, Kennedy proposed legislation requiring that hotels, motels, and restaurants admit customers regardless of race. He also asked that the U.S. attorney general be given authority to file lawsuits demanding the desegregation of public schools. Most of these proposals were passed in the Civil Rights Act of 1964 (42 U.S.C.A. § 2000a et seq.). Kennedy's achievements during his brief term as chief executive included an agreement with the Soviet Union to restrict nuclear testing to underground facilities; the creation of the Alliance for Progress, to establish economic programs to aid Latin America; and the creation of the Peace Corps program, which provides U.S. volunteers to work in underdeveloped countries. On November 22, 1963, Kennedy's term was ended by an assassin's bullets in Dallas, and Johnson was sworn in as president. Lee Harvey Oswald was charged with the murder. Oswald was killed two days later by Dallas nightclub owner Jack Ruby, while being moved from the city jail to the county jail. Johnson appointed a commission headed by Chief Justice Earl Warren to investigate the Kennedy assassination. In its report, issued in September 1964, the commission concluded that Oswald had acted alone in murdering Kennedy. Kennedy's assassination has remained one of the nation's most heated controversies. Many people were initially doubtful of the report's conclusions, and the skepticism has grown over time. Thousands of articles and books have been written that challenge the commisssion's findings and allege that agencies of the federal government withheld information from the commission and that the commission itself concealed evidence that contradicted its conclusions. In 1978 and 1979, the House Select Committee on Assassinations re-examined the evidence and concluded that Kennedy "was probably assassinated as a result of a conspiracy." Nevertheless, critics charged that vital information remained withheld from the public. In an effort to restore government credibility, Congress enacted the President John F. Kennedy Assassination Records Collection Act of 1992, 44 U.S.C.A. § 2107, which established the Assassination Records Review Board, an independent federal agency whose mission was to identify and release as many records relating to the assassination as possible. The board completed its work in 1998, releasing thousands of documents relating to the events on, and leading to, November 22, 1963. However, no conclusive evidence has surfaced to indicate the true assassin or any other individuals who participated in the assassination. Kennedy married Jacqueline Bouvier in 1953. They had two surviving children, Caroline and John F. Kennedy Jr. Following Kennedy's death, the activities of Jacqueline and the two children remained part of the American consciousness. In 1968, Jacqueline married wealthy Greek businessman Aristotle Onassis, who died in 1975. She worked as an editor with Doubleday until her death in 1994. John F. Kennedy Jr. emerged as a popular media figure, and in 1995 he founded the now-defunct political magazine George. However, like his father, the junior Kennedy died an early, tragic death when he was killed in a plane crash along with his wife and sister-in-law in 1999. Anderson, Catherine Corley. 2004. John F. Kennedy. Minneapolis: Lerner Publications. Kovaleff, Theodore P. 1992. "The Two Sides of the Kennedy Antitrust Policy." Antitrust Bulletin 37 (spring). Raatma, Lucia. 2002. John F. Kennedy. Minneapolis, Minn.: Compass Point Books. Schlesinger, Arthur M. 2000. 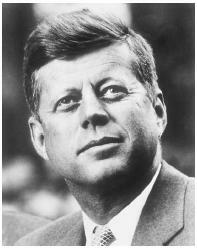 John F. Kennedy, Commander In Chief: A Profile In Leadership. New York: Gramercy Books. Cuban Missile Crisis; "Inaugural Address" (Appendix, Primary Document); Limited Test Ban Treaty; Warren Commission.